Legendary people pursue the impossible. Being less ambitious, I instead chase the uncomfortable – things that I know I can accomplish, but not without going through some inconvenience and annoyance at best or pain and loss at worst. 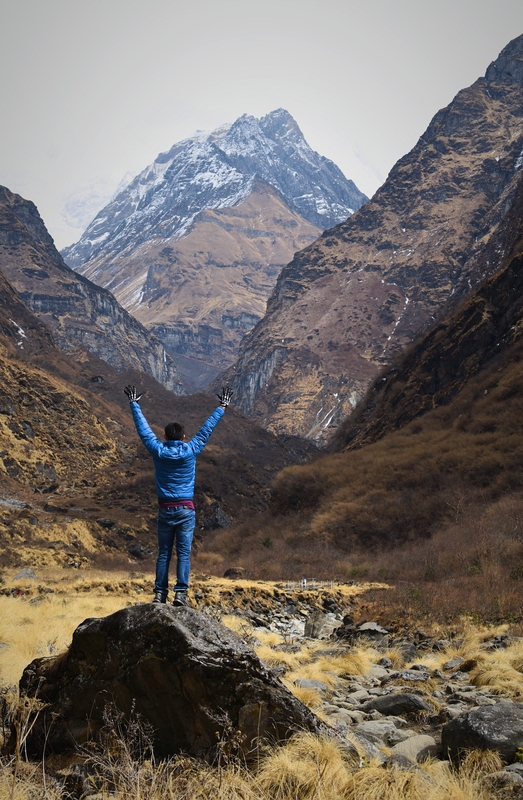 And thus I booked a 6-day trek to Annapurna Base Camp in beautiful Nepal, knowing the experience would be a condensed lesson in deferred satisfaction and that the ~4200m altitude would be temporarily punishing (it was) but ultimately manageable (it was). The trip was off to an auspicious start: our 400-person Etihad Airbus to Abu Dhabi was about 10% full, making the first 12-hour leg of the flight very enjoyable. The lounge at Abu Dhabi was amazing. A full meal and hot shower later I was boarding the 5-hour flight to Kathmandu when…surprise! A free, un-requested upgrade to business? I chow down my lamb steak and chug the Burgundy in seat 1D, chuckling at my good fortune. The landing in Kathmandu was eye-opening in its vacuous darkness. Never have I seen a capital city so devoid of light at night. My guide organizer, Pram at Landmark Expeditions, picked me up promptly from the skeletal airport and dropped me off at the hotel. Did I mention that the entire 7-day trip including room, board, transport, meals, and guide was only $700? I love Nepal already. I drift into deep slumber after a full 24 hours on the road, reaching nearly the opposite point across the globe. At 6AM the next morning it was go-time – I flew with my guide, Rajesh, on a 25-minute trip to Pokhara, admiring the uninterrupted Himalayan range piercing above the clouds en route. From Pokhara, 2.5 hours of arduous driving via dinky car and Jeep through some seriously dilapidated roads we arrived at Nayapul, the point of embarkation for our journey on foot. 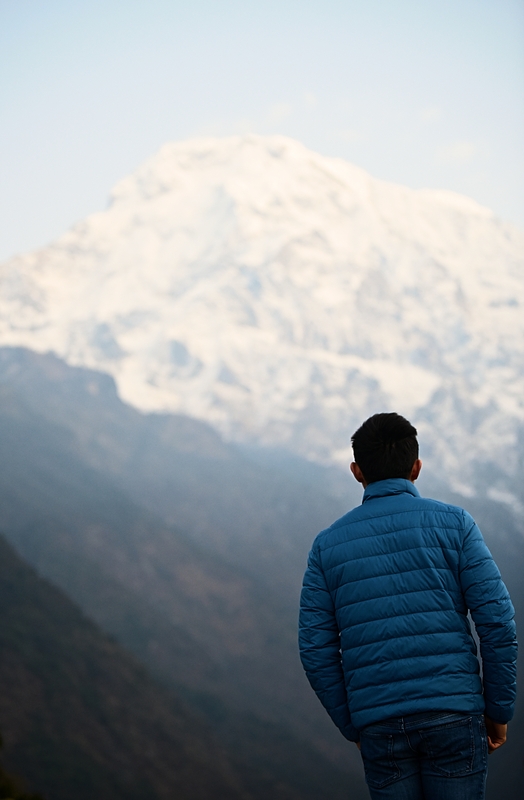 It was a bit clouding that day, but Rajesh looked unconcerned: thing change fast in the Nepali mountains, and whether we get a clear look at Annapurna when we arrive at ABC “depends on our karma”, he assured me. The first day of hiking, which was really only half a day since we started around 1PM, was physically manageable but mentally grueling: every time we gained some 100m of elevation up the stone stairwells we lose progress via an ensuing descent back to the valley floor like an Escheresque nightmare. 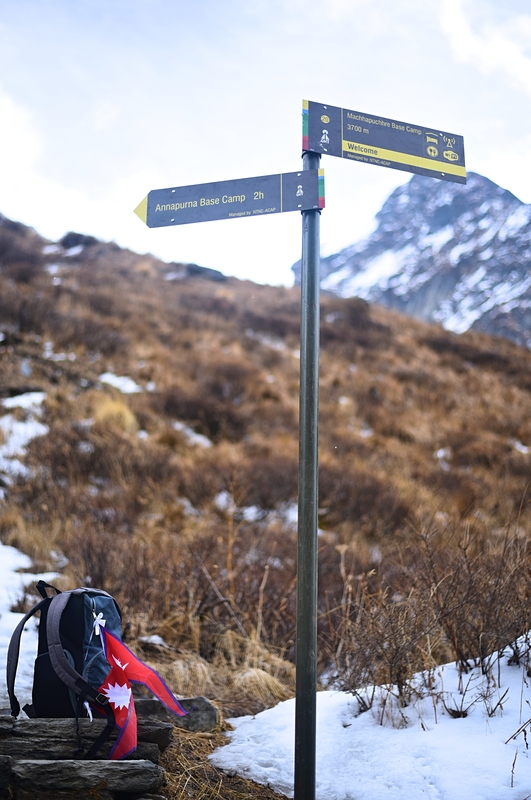 It would also be the first glimpse into the nature of the ABC trail where we would need to wrap around the many shorter mountains before delving into the heart of the Annapurna Sanctuary amphitheater. 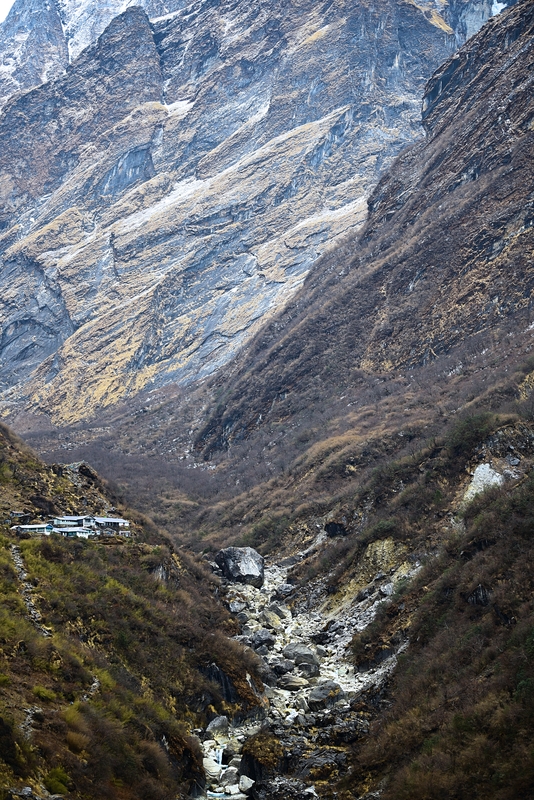 Just when you think the rondo would play on, the final push of the day takes us up a 800m, thigh-busting climb through the village of Jinhu Danda and into our accommodations at Chomrong, elevation 2340m. The lodging was basic but pleasant given we are now deep into the mountains in a fairly undeveloped country. There was still a hot though fickle shower and decent wi-fi available, and the kitchen whipped up some delicious chicken lo mein and vegetable pokoras for dinner. Here I met new friends from Denmark, Brazil, and India, all climbing at varied speeds towards the ultimate goal of ABC. It was still a bit cloudy at sunset, but off in the distance I glimpsed the snow-covered peak of Annapurna South, the protective outer shell of the Sanctuary that hid the crown jewel, Annapurna I, behind. It looked so close, yet so far away. The temperature drops quickly in the mountains after the 6PM sunset, and I tuck myself into my sleeping bag soon after dinner after stretching out the legs for tomorrow’s challenges ahead. Around 6:15AM, the early sunrise dispelled the thick fog that shrouded the mountains last night, and we all stood in awe at the much clearer view of the majestic snowy peaks in the distance. A brisk breakfast later we marched on with renewed energy. The initial leg of the day was a descent back towards the valley floor, where we crossed a long suspension bridge above the river. 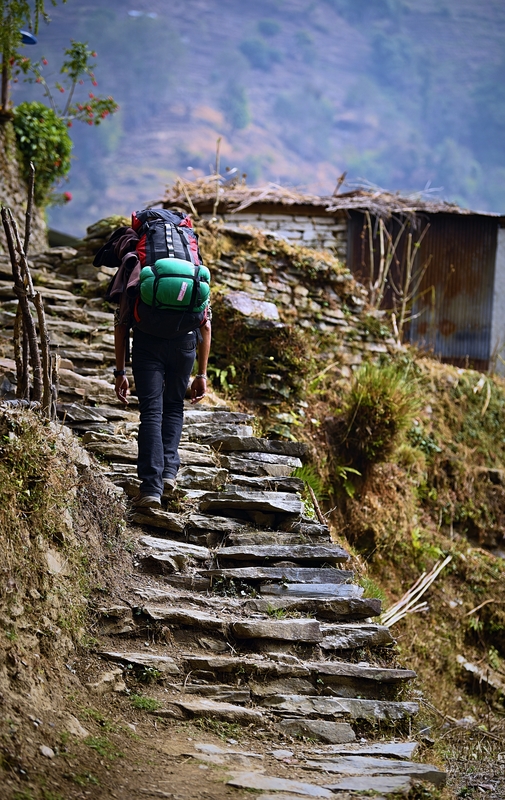 Thereafter we climb up through the villages of Lower and Upper Sinuwa, regaining the elevation we had lost earlier. A sign in multiple languages appeared by the path, warning visitors that chicken, pork, and other meats are now prohibited beyond this point due to religious beliefs as we near the sacred Machapucchare Mountain. 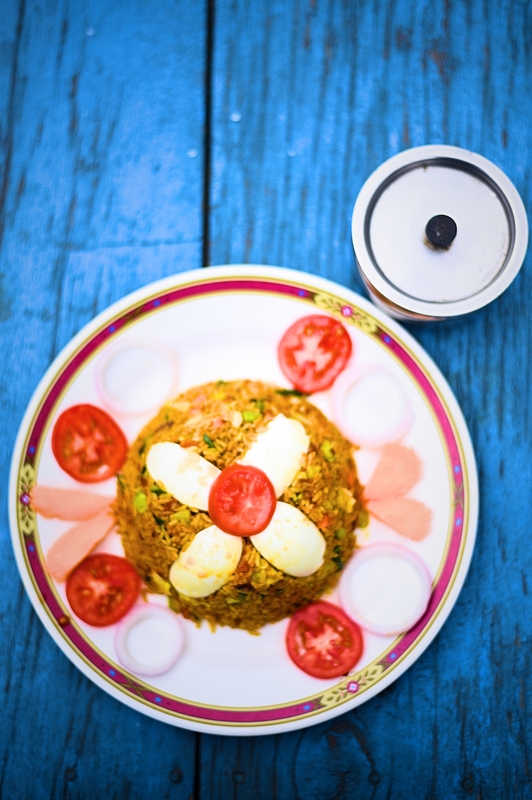 We stop for lunch at Bamboo, a tiny village sans wi-fi, where a smiling woman took her time to whip up a delicious plate of fried egg biryani, by far the best plate of food I’ve had on the trek. In the early afternoon we push past the village of Doban into Himalaya Hotel by around 3PM, where we stop early for the night at Rajesh’s suggestion to acclimatize near 2700m. My new Brazilian friends made it here as well and I also met new friends from China and Poland, people who come from really interesting and different backgrounds from my little finance bubble, and we converse (in much colder climes) over still-delicious though now-vegetarian dinners. My room had 6 beds in it, but due to it being well before peak season I had the giant room all to myself. 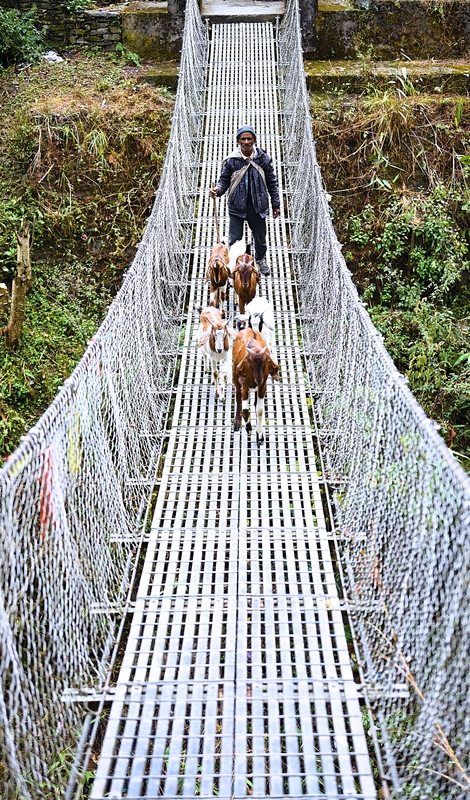 The hot shower here was surprisingly even better than at Chomrong and I freshen up my tired legs, tucked myself into a thicker layer of clothing than yesterday, wrapped myself tightly into my cocoon, and off to Sleepland I drifted. We sped out of Himalaya Hotel before most of the other lodgers, heading for the last village before we enter snowy Base Camp territory. The 1.5 hour trek to Deurali, elevation 3100m, was more of the same: sweeping views of the tundra landscape, ever-magnifying views of the magnificent snow peaks, the occasional story here and there of unruly tourists falling to their deaths in the freezing river below. 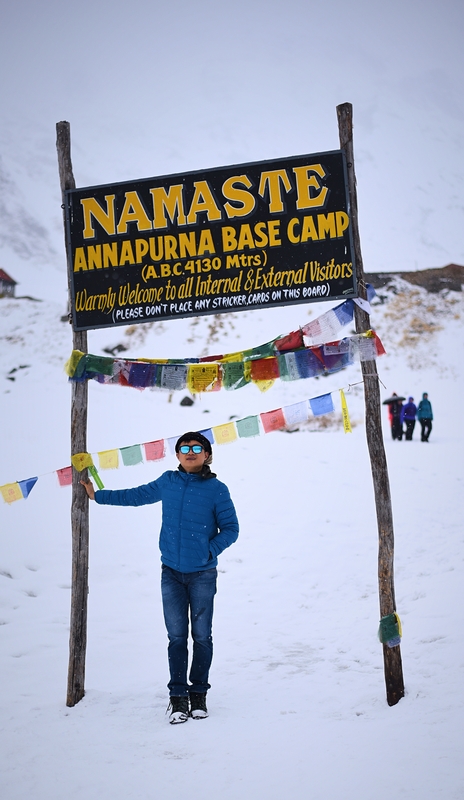 2 more hours of upward momentum later, with the air getting thinner and the ground sneakily and suddenly turning snow-covered white, we arrived at Machapuchere Base Camp (MBC), elevation 3700m. Here it hit me all at once: the dramatically reduced oxygen level in the air, the its-probably- nothing-but-could-be-frostbite-bye-bye-foot feeling in the toes, and the slow realization that here, if you get sick, there is no modern medicine within reach to help – you just gotta soldier through it all. 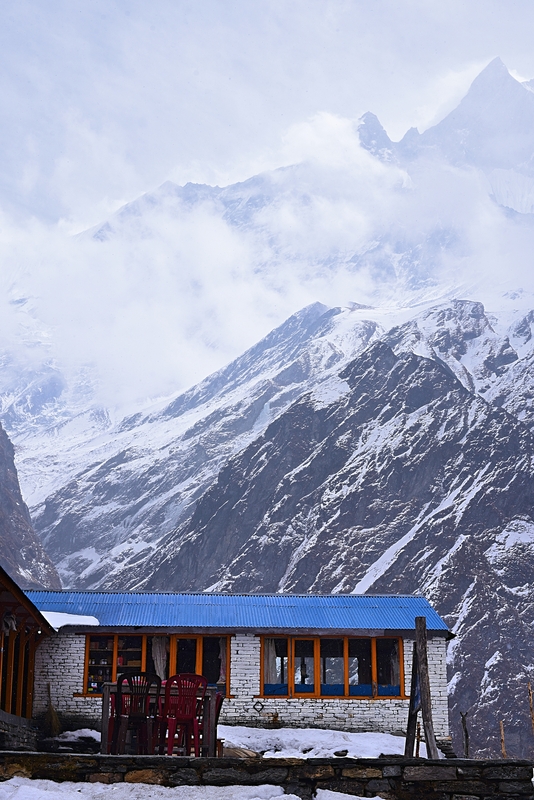 Finally, in the distance, the familiar blue rooftops emerged – Annapurna Base Camp! I run into the warm embrace of the walls – only to realize it remains sub-zero inside. No matter – nourishment and overpriced ginger tea awaits. A rhythmic pounding has started in my head – that dreaded altitude sickness at 4130m has kicked in – and the only remedy was to chug down 3 thermoses of ginger tea. It was 5:30AM when our collective alarms went off in the midst of total blackout. We check our toes for frostbite – still attached, I see – and stumble outside. 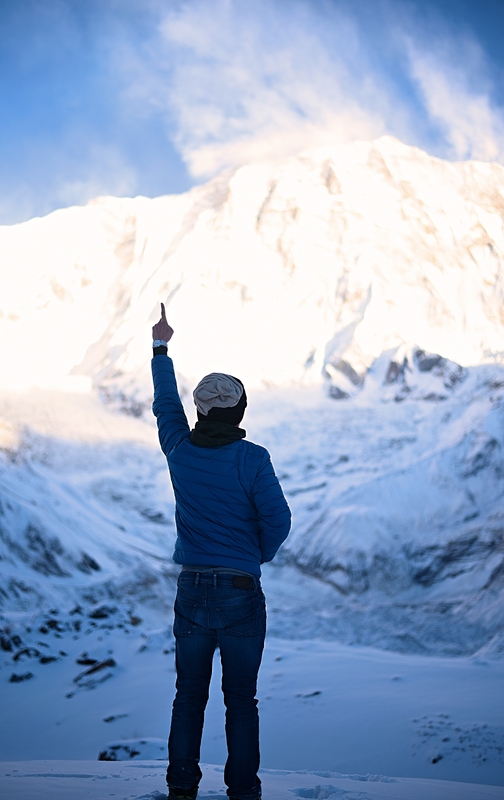 The snow stopped and the skies have turned an eerily dreamy blackblue with a web of infinite stars dancing behind the jagged silhouettes making up the Annapurna Amphitheater. By 6:30AM the sun rays have started to peak through from behind us, and the magnificent Annapurna I – elevation 8091m – starts to catch fire. This is it – the culmination of our journey deep into the heart of a remote locale in a distant country: it didn’t matter if we were from the US, Sweden, Brazil, Poland, China – one thing was for certain, we ain’t seen anything like this before in our lives. Namaste – we did it! It is interesting writing about the journey almost 2 months after it took place, back in the comfort of my New York home, because unlike most other trips I can still recall every little detail – from the ruthless bite of lactic acid in my thighs to the wordless awe of seeing an 8000-footer up close. I guess at the end of the day, we are all just the sum total of our experiences, and that totality for me now includes a persistent memory nearly impossible to replicate without paying homage to the mountains yourself. Whatever it is one is supposed to find on a spiritual journey like this – zen, nirvana, enlightenment – I found it. Beautiful! I need to visit soon.